-HOW DO I GET TO WASHINGTON ISLAND? -WHERE DO I BUY BOAT AND CHERRY TRAIN TICKETS? -WHAT IS THE COST FOR A ROUND TRIP TO WASHINGTON ISLAND? -WHAT IS THE COST FOR A CHERRY TRAIN TOUR? -MAY I PURCHASE A COMBINATION TICKET FOR THE FERRY BOAT TRAVEL AND CHERRY TRAIN TOUR? -WHAT PASSENGER/FERRY BOAT DO I TAKE? -MAY I BRING MY VEHICLE AND PARK IT WHILE I RIDE THE CHERRY TRAIN? -WHAT HAPPENS WHEN THE WEATHER IS BAD DURING A CHERRY TRAIN TOUR? -WHATS THE WEATHER LIKE ON WASHINGTON ISLAND? -WHEN THE FERRY BOAT DOCKS ON WASHINGTON ISLAND...THEN WHAT? -IF THE CHERRY TRAIN VEHICLES ARE PARKED AT THE ISLAND DOCK, MAY I BOARD? -HOW LONG IS OUR CHERRY TRAIN TOUR? -WHAT STOPS DO WE MAKE? -IS FOOD SERVED ON OUR CHERRY TRAIN TOUR? -MAY I BRING MY PET(S) ON THE CHERRY TRAIN TOUR? -WHAT IS THE CANCELLATION POLICY FOR ANY TOUR? -ARE THERE ACCOMMODATIONS ON THE ISLAND? -WHERE CAN I VIEW A CHERRY TRAIN VIDEO? How do I get to Washington Island? Actually, you need to get to NORTHPORT PIER first. We are approximately 45 miles North of Sturgeon Bay, Wisconsin (approximately 1 hour of driving) at the very end of Highway 42, Door County. As you enter the small town of Gills Rock, Wisconsin, TURN RIGHT, (90 degree turn), and follow Highway 42 to the very end of the road. Do not stop OR park at Gills Rock. There, you will see the Washington Island Ferry Boat dock and free parking. There is NO Cherry Train Tour in Gills Rock. We are 2 miles North (beyond) Gills Rock! All of the boats carry passengers and vehicles (See our Cherry Train Boat/Tour Schedule in FAQ). Be sure to watch for the CHERRY TRAIN TOUR AND FERRY BOAT DIRECTIONAL SIGNS, as you approach Gills Rock. Where do I buy my Boat and Cherry Train Tickets? There is a Ticket Booth located at Northport Pier, Wisconsin (on the dock). There is free parking in designated lots at Northport Pier. They accept Visa, Mastercard, Discover. You may also purchase your Cherry Train Tour tickets at the Cherry Train Building located on the Ferry Boat dock on Washington Island. What is the cost for a round trip to Washington Island? What is the cost for a Cherry Train Tour? May I purchase a combination ticket for the Ferry Boat travel and Cherry Train Tour? Yes. The ticket cost for the combination Adult Ferry/Cherry Train Tour is $24.50 and for children between the ages of 6 through 11, the ticket cost is $11.50. There is no charge for children age 5 and under. What Passenger/Ferry Boat do I take? Northport Pier is approximately a 1 to 1 1/2 hour drive north (45 miles) from Sturgeon Bay, Wisconsin, 2 miles beyond the last village of Gills Rock. There is no tour in Gills Rock. Boat time 10:00 A.M. (or earlier boats) - Cherry Train Tour Time 11:00 A.M.
Boat time 12:00/Noon (or earlier boats) - Cherry Train Tour Time 1:00 P.M.
Boat Time 9:45 A.M. (or earlier boats) - Cherry Train Tour Time 10:30 A.M.
Boat Time 11:15 A.M. (or earlier boats) - Cherry Train Tour Time 12:00/Noon. Boat Time 1:15 P.M. (or earlier boats) Cherry Train Tour Time 2:00 P.M.
Boat Time 2:45 P.M. (or earlier boats) Cherry Train Tour Time 3:30 P.M.
Boat Time 10:00 A.M. (or earlier boats) Cherry Train Tour Time 11:00 A.M.
Boat Time 12:00/Noon (or earlier boats) Cherry Train Tour Time 1:00 P.M. Extra boats departing Island on Friday, Saturday & Sunday. Check the boat schedule brochure or telephone (920) 847-2546 for boat information. No. It is suggested that in case of inclement weather on the Door County mainland, a call to the Ferry Boat Company (920) 847-2546 or Cherry Train Tour office (920) 847-2039 is advisable. May I bring my vehicle and park it while I ride the Cherry Train? Yes. Free parking is available within yards of the Island Ferry Boat dock. Let us show you the spectacular beauty of our Island and explain the rich history that has made this island famous....and then, go explore on your own. Everyone believes the only way to see and get to know our island is, first, on the Cherry Train....and all of that in approximately 1 1/2 hours to 2 hours and 15 miles. What happens when the weather is bad during a Cherry Train Tour? Every attempt will be made by your Guide/Driver to accommodate all passengers during this period. Rain protectors will be offered and stops/shelters will be sought. We are not responsible for the weather, but we will do everything that is possible to insure your comfort while on board the Cherry Train. Overcast sky or a chance of rain will not be reasons for us to cancel a tour. Whats the weather like on Washington Island? Beautiful!! Our summers are gorgeous with temperatures in the 80’s and always a wonderful cooling breeze by the water. Spring and Fall are beautiful....flowers, flowers, flowers and Fall colors that will amaze you. Bring your camera!!! (The Cherry Train sells cameras, film and batteries, if you forget or need replacements). Island temperatures tend to be cooler than on the mainland. Warm clothing is advised in Spring and Fall. We suggest that you bring a jacket or sweater. When the Ferry Boat docks on Washington Island....then what? You will see the Cherry Train Tour building approximately 50 yards down the dock, on your right. Our vehicles and trams usually are awaiting your arrival. If we are out on tour with all of our fleet, a short waiting time can be filled with visits to the dock restaurants and gift shops. Restrooms are available at our island Welcome Center and the Ferry Boat Main Building. If the Cherry Train vehicles are parked at the dock, may I board? Yes. You are welcome to relax on board until a Cherry Train Tour Guide collects your ticket(s) prior to tour departure. All tours depart and return to the Island Ferry Dock. How long is our Cherry Train Tour? Approximately 1 1/2 to 2 hours, including stops. Fully narrated by Washington Island resident guides, everything you ever wanted to know about our island is covered in the narration....if you have questions, we will be more than pleased to answer....sometimes with a folklore story included!! What stops do we make? We make 3 stops along our 15 mile historical/scenic tour (See our beautiful brochure located at businesses throughout Door County or call us and we would be happy to send you one prior to your trip to the island). Stops are selected from: Schoolhouse Beach, Art and Nature Center, Ostrich/Exotic Animal Farm, Farm Museum, Jacobsen Museum and the Norwegian Stavkirke Church. 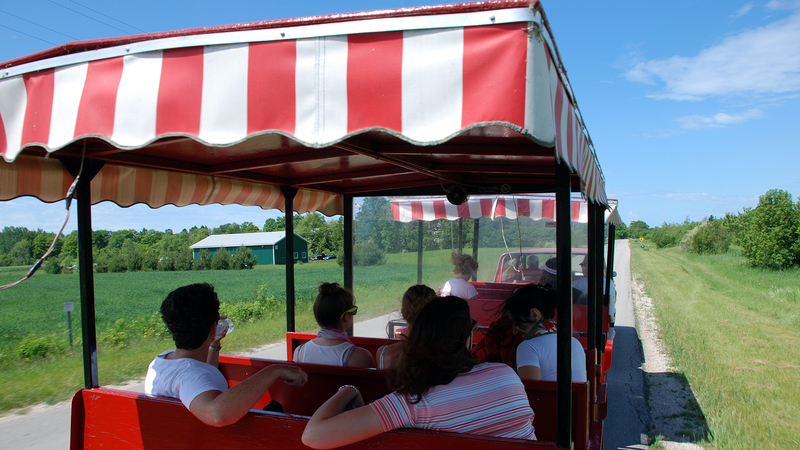 Cherry Train Tours do not own or derive financial gain from any of the independently owned stops. Some do not have any extra fees beyond the tour price(s). Stops are approximately 15 minutes long. Each driver will select the stops for each tour, depending on the weather and site availability. Again, have a camera ready for some beautiful picture taking. 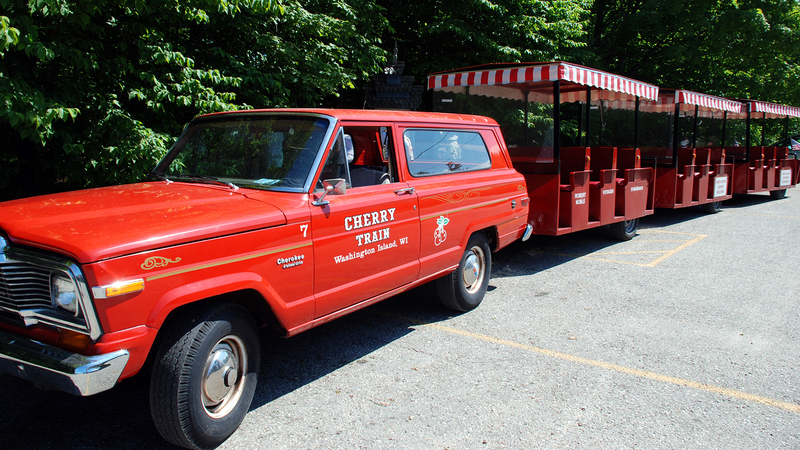 Is food served on our Cherry Train Tour? No. Within a very short walk, there are restaurants and gift shops at the Washington Island Ferry Boat Dock area. Both fast foods and formal dining is available. Also, the Cherry Train building located on the Ferry Boat dock sells a full line of snacks, soda pop/lemonade/bottled water, etc. May I bring my pet(s) on the Cherry Train Tour? No. Insurance and licensing regulations will not allow us to transport animals on the tour. Certain stops (Ostrich/Exotic Animal Farm and the Farm Museum) have animals that will delight audiences of all ages!! What is our Cancellation policy for any tour? We cannot predict when or why a regularly scheduled Cherry Train Tour may not be offered after you have purchased your ticket. If we have to cancel, change or alter any tour time and you want a full refund of your Cherry Train ticket(s) we will honor your request, in full. Are there accommodations on the Island? Yes. We have many resorts, motel/hotels on the island, at rates that are very reasonable. We are the best kept secret in the world of travel...beauty, peace and quiet. Friendly islanders who cherish this land are eager to share it with you!! Please refer to our publication...EXPLORE WASHINGTON ISLAND. This is a complete informational brochure available at the dock in brochure holders or by logging onto www.washingtonislandchamber.com. - Our Washington Island Chamber of Commerce (920) 847-2179. Yes!! The Cherry Train offers the choice(s) of charter reservations for Bus Tours, Weddings, Business Tours, Family Reunions/Outings, Boy/Girl Scouts, School Functions, International Touring Groups, Office Parties, Anniversary Gatherings, Seminars, Surprise Party Tours, Sports Groups, Conventions, etc. We offer customized tours of any size group. We also provide Step-On Guides for your Bus Tour to our Island. Our Ferry boats will transport your bus and passengers in the comfort of a 30 minute ride, all while you relax on your bus enjoying the gorgeous view, colors and constant beauty of Spring, Summer and Fall!! An island experience is truly the highlight of any tour. Our native island guides provide the history, legend and folklore...along with earthy island humor and stories you won’t believe!! Lunches are available for all charter tours. Fish Boil dinners are a new offering, celebrating and reflecting our rich Icelandic Heritage. You may select any larger restaurant for your groups to the Ships Wheel and Findley’s Holiday Inn. Both of these fine family owned restaurants offer delicious, plentiful home cooking...along with breathtaking waterfront views. Bon Appetit!! Contact the Cherry Train Office at (920) 847-2039 for a brochure/information kit, sent with absolutely no obligation or high pressure for your casual reading and response. We let our friendly, flexible service speak for itself!! And the best part - you’ll get to talk with a live person, generally the owners!! Or, e-mail your request to: www.cherrytraintours@itol.com. Where can I view a Cherry Train Video? Now you can view our Tour on YouTube.com. Go to YouTube.com and type in Cherry Train. You will enjoy our Travel Channel Video of a typical tour.